Why the program should be registered? ABF Outlook Backup is distributed on a Try Before You Buy (shareware) basis. It means that you can download the program and try it for free within 30 days trial period. Trial version has some restrictions. 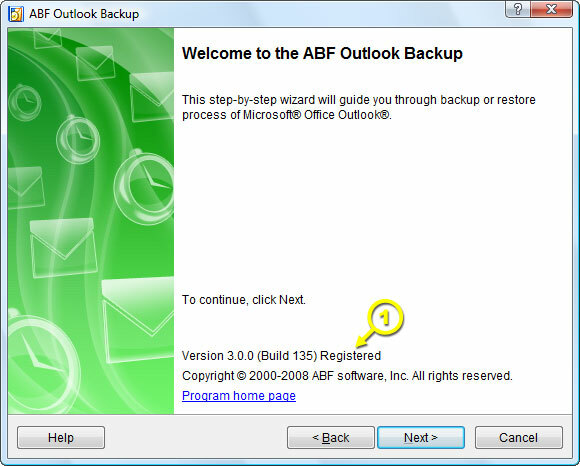 If you like ABF Outlook Backup and want to have a full version of the program, you will need to purchase a registration key. All limitations will be removed as soon as you register your copy of ABF Outlook Backup. • will not allow you to create self-extracting backup files. To register ABF Outlook Backup you must purchase a registration key. See the ordering page for more details (outlookbackup.com/buy.shtml). After ordering process is complete you will receive a registration email with ABF Outlook Backup registration key inside. Figure 2. Welcome step (trial). Ensure you are connected to the Internet and click Activate button (Figure 3. Pos 1.) Wait till the program connects to our server and activates your key. 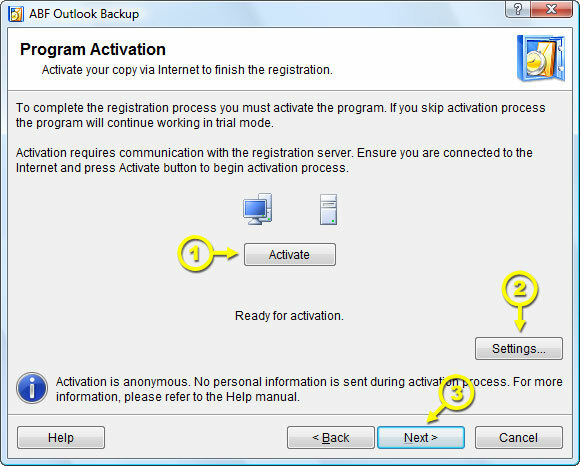 Once activation is finished your copy of ABF Outlook Backup becomes registered. Click Next (Figure 3. Pos 3.) to continue working with the program. If you use proxy server for your Internet connection click Settings button (Figure 3. Pos 2.) - Activation Settings window will appear (Figure 4.) Check Use the proxy server for activation checkbox, enter your proxy server settings and click OK button. How to find out if the program is registered? Figure 5. Welcome step (registered). (Figure 5. Pos 1. ), near the program's version at the bottom of the window.